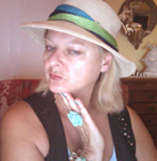 In about a couple of weeks, I will be filming many California homes for an Italian T.V. station, in Italy. The producer is looking for homes of all types from extravagant to traditional, from elegant to casual and definitively homes that are not Italianate looking. The idea of the show is to highlight California living and to show to European audience how people live in these parts of the world. 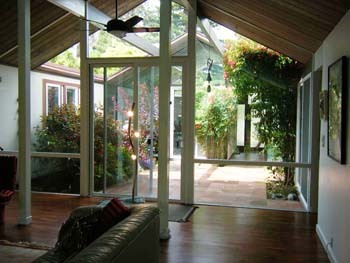 American homes are characterized with large open spaces, rooms communicating with each other, high ceilings, grand foyers, lighting effects, exterior vegetation, 3 to 5 cars garage, all features so very different from European homes. In fact, not by accident the title of the show will be Dreaming California. 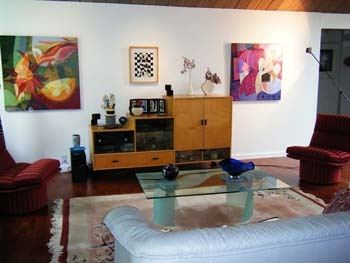 Some of the homes I designed for my clients will be filmed too, but there is one particular home I am interested in featuring, the Eichler home owned by one of my friend, an art painter. 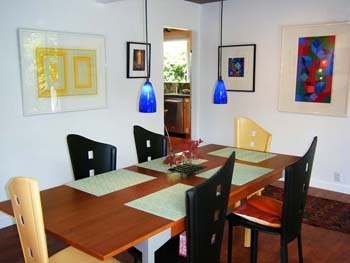 This style of home is the perfect setting for an artist, vibrant, modern, open and transparent. Eichler style architecture was designed by real estate developer Joseph Eichler between 1950 and early ‘70s, as a post war innovative architecture, affordable for the mass and all races. GIs returning home after WWII needed to create families, thus building homes fast and cost-efficient was a high demand of the market in the ‘50s. The Eichlers were the first track homes constructed with standard material in a remote location and shipped where the building sites were. For the very first time this innovative concept was applied to home’s production, just as in the car industry assembly lines. Prefabricated homes in different styles are still produced. The indoor-outdoor concept of these homes was for the first time featured on brochures and marketing materials of the ‘50s, something we have returned to like sixty years later. The indoor- outdoor concept is so much part of today’s living, feeling that inner peace that only nature can provide is well recreated today with large windows, sliding doors, mirror reflections, outdoor rooms, or even operable walls. Exactly how the Eichler home was conceived then. The particular features that sold these homes were open floor plans, flat roofs, interior atrium, post and beams, large glass walls, radiant heating, cork flooring, wood paneling. The builder’s goal was to offer to everyone the same details of elegant homes with affordable and eco-friendly material. Ah! This is want homeowners want today too! Living in an Eichler today doesn’t have the same meaning that had in the’50s, it seems that this very particular style of architecture attracts people with certain traits, it fits the artist’s profile and any person in a creative field. The interior décor cannot be any different from modern, colorful, vibrant, eclectic, or even extravagant, it’s a must, otherwise will not fit the linear and simple architecture. A traditional décor will totally clash. The owners of an Eichler home who lived in it since the ‘50s are now tired and are selling these beautiful properties, giving a good inventory to the real estate agencies. Unfortunately, this architectural style marked an era, the Eichler home has become almost historical architecture and no longer is considered a ‘track home’ for the mass. With a higher status label comes the high price too. 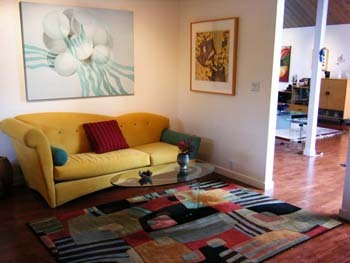 I know my friend the artist will never leave her Eichler. She selected excellent furnishing by herself, accessorized it tastefully and added some travel memorabilia pieces for a touch of whimsy. She changed it into a small, but pleasant paradise and of course, to feed her soul, she created a colorful vegetation, she can enjoy from anywhere in the house, but especially from her studio while she is painting her art.